Has it been two weeks already? It appears so, which means it's time for another trip to the farm. But first we check in with an old friend. 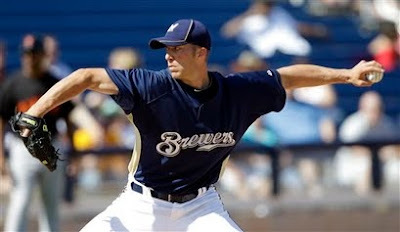 Chris Capuano - SP - Let's talk about Cappy. He and his twice repaired elbow were absolutely lights out for the Brevard County Manatees in his three rehab starts. He pitched 14.2 innings, struck out 17 batters and walked none. He also only allowed two runs for a paltry 1.23 ERA. Capuano has been promoted to Triple-A Nashville where he will continue to start, here's hoping he continues to pitch well because who knows how long Doug Davis is going to last in the Brewers starting rotation. Peter Fatse - IF/OF - Fatse has found himself in a pretty deep slump since his hot start, over his last 10 games he's batting just .182 and hasn't had an extra base hit since May 2. His home and away splits emulate the big club, he's batting just .200 at Time Warner Field and .359 on the road. Chris Dennis - OF - The Canadian outfielder has also struggled since we last checked in, though not as much as Fatse. Dennis is batting .235 over his last ten games but does sport an OBP of .333 during that stretch. His four homers lead the team. Ryan Gennett - 2B/SS - Scooter Gennett, on the other hand, has been making a name for himself. Over his last ten he's batted .378 to up his season average to .356 and he leads the T-Rats with 12 doubles. Throw in an impressive OBP (.443) and you have the teams best hitter so far. Jake Odorizzi - SP - Odorizzi has struggled since we last checked in, he had a couple of short starts where he gave up three and four earned runs consecutively, but his command has been on overall. In his last outing he struck out eight batters in 5.2 innings while only allowing two runs. Eric Arnett - SP - Last year's first round draft pick has managed just one good outing so far this season, a rain shortened three inning appearance a week ago when he allowed no runs. In every other appearance this year he's allowed no less than four runs. Kyle Heckathorn - P - Thorny's last two outings have been a mixed bag. On May 1 he gave up four runs in 3.1 innings and walked a trio. He followed that up with a four inning appearance in which he struck out five, walked none and gave up two runs. Interesting split: in games that Heckathorn didn't start his ERA is a full seven runs lower. Don't read too much into that though, it's still early. Best of the Rest: Khristopher Davis (OF) leads the team in total bases with 55; Damon Krestalude (SP) has a team low WHIP of 0.95 and Cutter Dykstra (2B) is hitting .286 in his second stint with the Rattlers. Erik Komatsu - OF - Komatsu continues to be the bright spot in an otherwise poor offense for Brevard County. He may not be hitting for power (nobody on that team is) but he is hitting for average (.330). His ten doubles lead the Manatees as well. Kentrail Davis - OF - Davis is back and in the lineup every day and he seems to be settling in. I doubt we've really seen what he can do yet, but he had hit in every game since coming back healthy going into Tuesday night. We should have more to say about him two weeks from now. Josh Prince - SS - Hey remember this guy? 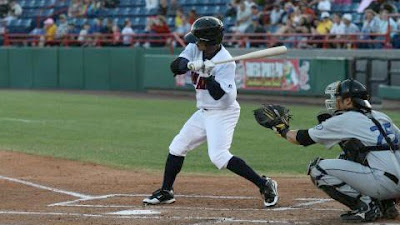 A third round pick a year ago, Prince is playing every day now for Brevard County with the promotion of Brent Brewer. He's done well since being inserted into the starting lineup, hitting .306 in his last ten. Michael Fiers - SP - Fiers had his first truly bad start on Monday night, when he gave up five runs in 4.1 innings. His season numbers are still solid though, his ERA sits at 3.32 and his WHIP is a low 1.08. Wily Peralta - SP - Peralta on the other hand has been consistently average since we last checked in. He's given up runs in each of his last three appearances but no more than three. Basically, he's been fine but not great. Cody Scarpetta - SP - The breaking ball specialist, Scarpetta has been much improved over the last two weeks. Over his last three starts he's given up zero, one and two runs while lowering his season ERA to a respectable 3.45. He seems to have recovered his command that he struggled with in the early part of the season. Best of the Rest: Nick Green (RP) is sporting a 1.54 ERA; Shawn Zarraga (C), who is starting in place of the promoted Martin Maldonado, is batting .396 through 12 games. Lorenzo Cain - CF - He most certainly is injured and has not played since our last Farm Report. It doesn't appear to be serious but the team is going to be very careful with the highly touted Lo Cain. Caleb Gindl - RF - The diminutive slugger, Gindl has been quiet his last 10 outings batting just .250. But he hasn't seen his numbers against left-handed pitching suffer at all, on the year he is hitting a very impressive .474 against southpaws. That's important because a year ago the left-handed hitting Gindl's biggest weakness was hitting lefties. Taylor Green - 3B - Green has been quieter over the last 10 games, batting only .200 but his plate patience hasn't suffered at all. Through that stretch his OBP is .300, unimpressive by itself but very good to see with his scuffles at the dish. 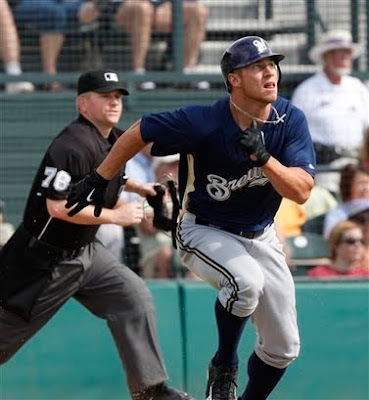 Brett Lawrie - 2B - Some good and some bad for Lawrie, I'd say more bad then good. His 52 total bases lead the team and 13 walks is tied for the most on the Stars but 46 strikeouts in 32 games is completely unacceptable and borderline absurd. That's 25 more than anyone else on the team. You can see the potential, but Lawrie still has a way to go. Amaury Rivas - SP - Rivas is quietly showing why he could be considered the top starting pitching prospect in the Crew's system. In five of his six starts he's given up one or less runs; he has been so effective that his last outing (in which he gave up five runs) raised his ERA to a still very low 2.10. His strikeouts are down, but his WHIP is very good for a starter at 1.19. Mark Rogers - SP - After a pair of poor starts in which he gave up five runs in 2.1 innings and three runs in four innings, Rogers bounced back with one of his better starts of the year. His last time out he pitched five shutout innings of one-hit ball. Very good, not so good is that he's walked more batters (21) than he has struckout (20) in 2010. Mike Jones - SP/RP - It seems more and more likely that Jones future chances will come as a relief pitcher. He made a couple of spot starts this year and struggled mightily, in his two starts his ERA is 9.00. But in 17 innings of relief Jones has a very nice ERA of 2.65. Personally I just want to see him make it to the majors, the role is unimportant. Best of the Rest: Martin Maldonado (C) is hitting .296 and has 10 RBIs in 19 games; Brent Brewer (SS) is batting .346 since his promotion (I am shocked by this) and Brandon Kintzler (RP) has yet to give up a run or a walk while striking out 15 through 13.2 innings. 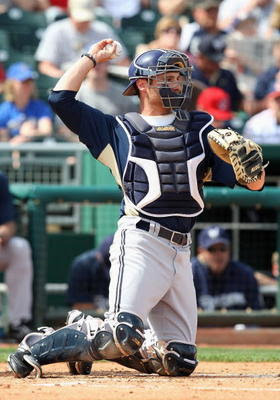 Jonathan Lucroy - C - The former Ragin' Cajun has cooled off after a hot start to his Triple-A career. In his last ten games he's batting just .244 and has struckout a surprising (for him) nine times. There is a reason players shouldn't skip Triple-A, but Lucroy will be just fine. He hit his first home run of the season last week against Round Rock. Eric Farris - 2B - Just as he was starting to swing the bat well, Farris landed on the Disabled List. He hasn't played since April 29, John Raburn has seen most of the playing time in his place. Adam Heether - 3B/UTIL - Heether seems to be coming out of his April slump, in the month of May he's batting a solid .286. He's also hit safely in eight of his last nine games. On this team it seems worth mentioning that he's managed to stay healthy. 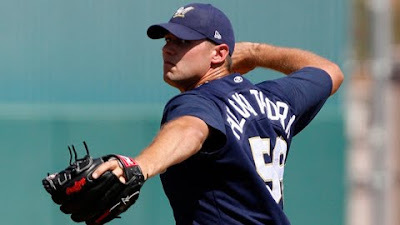 Tim Dillard - RP - He's given up some runs of late, his ERA now sits at 3.93, but his command has still been impressive. Through his 18.1 innings Dillard has struckout 17 and walked only one. Zach Braddock - RP - Braddock had his scoreless start end in spectacular fashion on Sunday, when he gave up eight runs in .2 innings. That disastrous outing saw his ERA climb from 0.00 to 5.14. Well, it had to happen sometime. Braddock has 24 strikouts in 14 innings. John Axford - RP - On the other hand, we have John Axford - who hasn't given up an earned run since April 16. He has been a very consistent reliever for the Sounds and his command has been good. He's walked five against 17 strikeouts, he has to be high on the list if the Brewers need to call up a relief pitcher this season (as long as it isn't David Riske I'll be happy). Best of the Rest: Chris Smith (RP) has an ERA of 0.71 and 12 saves; The sounds starting rotation of Marco Estrada, Chris Waters, Chase Wright, Kameron Loe and Chuck Lofgren boasts no ERA higher than 4.26 and Trent Oeltjen (OF) is batting .281.